Today's Draw: Ace of Cups in the What to Know position from the Sola Busca Revisited by Elaine Wilkinson and the Deck of 1000 Spreads. Do you know love? Can you feel it for a stranger? Can you feel it for your enemies? 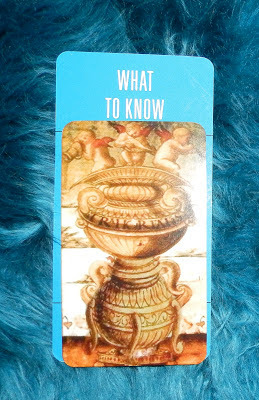 If you took today's cards literally and simply, they'd say "love is what to know". Yeah, yeah. I know what you're thinking..."phew, I can skip today's post because I know love." But don't exit the building just yet, missy. Because I say back to you, "naw, you only know easy love." Truth is, "easy love" is all that's expected from us in this life. Opening our heart to God or Oprah is easy. Gazing lovingly at our children and pets is easy. And, hard as it may seem sometime, wishing goodwill for our partners is easy. What's slightly hard is loving yourself. Harder still is loving a stranger you've never met. But the really hard thing is to look into the eyes who has hurt or harmed you and wish them the same joy you wish for yourself. When I pulled today's pair, I immediately thought of the Buddhist practice of loving kindness or metta bhavana. This practice is key to the Buddhist religion and cultivates goodwill for all living beings. For you and me, doing a metta meditation can be a very emotional and enlightening practice. Basically you visualize different people, open your hearts to them and wish them goodwill and happiness, as you would wish for yourself. It starts out with the easy people...people you already care for. And it gets harder as you move toward people who have hurt you. Ultimately you open your heart in love and goodwill to all beings on earth. This meditation can be a good way to let of issues you have with a particular person. It's also a good way to give yourself an attitude adjustment when you hate life. And, done regularly, it can really up the ante on your spiritual practice. Few things compare with the ability to love all sentient beings. We're all familiar with the common kinds of love—familial, platonic, romantic, motherly/fatherly, god-centered. These kinds of love flow through us effortlessly and are usually returned. But I think we can't really KNOW love until we know how to love universally and without the kind of payback we're used to receiving. When you love everything, most things don't even know you're loving them. So don't expect them to send you flowers. But do expect it to change the way you see your world and what it reflects back at you.